On April 2, 2006, over 25,400 sports fans packed into Robertson Stadium on the University of Houston campus to see the first ever MLS match to be played in Houston. The match featured the newly minted Houston Dynamo, formerly the San Jose Earthquakes, hosting the Colorado Rapids and the star of the night was a Hawaiian forward named Brian Ching who scored the first goal and then three more in the 5-2 Dynamo victory. Therefore, it was fitting that it was Brian Ching who scored the last Dynamo goal, the last MLS goal, at Robertson Stadium, ensuring that the Dynamo would advance to the 2011 MLS Cup Eastern Conference Final. 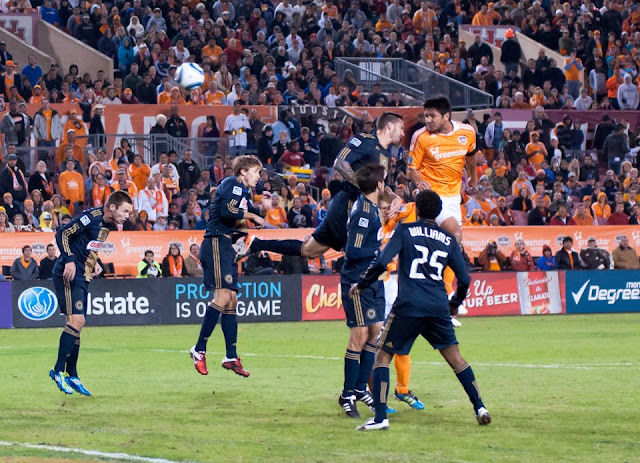 On Thursday November 3, 2011, over 24,700 Houston soccer fans were on hand to watch the Houston Dynamo host the Philadelphia Union in the second leg of the Eastern Conference Semifinal and to say goodbye to Robertson Stadium. This past Sunday, the Dynamo picked up a 2-1 win at Philadelphia in the first leg of the semifinal. Brian Ching picked up his goal in first half stoppage time. Fittingly, Brad Davis picked up an assist on that goal. After 90 plus minutes, all the Dynamo needed was Ching's goal, giving them a 1-0 win in the second leg and a 3-1 aggregate victory in the MLS Cup Eastern Conference Semifinals. As you will hear in an upcoming podcast, the significance of Ching picking up the last Robertson Stadium goal was not lost on those connected to the Dynamo organization. Following the match, Chris Canetti, Stuart Holden, Dominic Kinnear, and several Dynamo players all reflected on the fact that Ching goals book end the franchise's Robertson Stadium era. This season will mark the 4th time in six years that the Dynamo have advanced to their respective conference finals, the last time being in 2009 when they lost to the Los Angeles Galaxy in a controversial match. In the sporting landscape of Houston where the Astros are considered one of the worst teams in Major League Baseball, the Rockets have been so poor that the NBA lockout barely seems to register as a concern, and the Texans are just now starting to have a serious chance at making the playoffs, the Houston Dynamo, with its MLS Cup championships in 2006 and 2007, have truly been a bright spot, bringing pride to the city. A new era in professional soccer in Houston will begin next season when the Dynamo move into their new downtown stadium, but one thing that never changes is the Dynamo's drive to win the MLS Cup. The Dynamo don't have much time to relax and enjoy their victory because they'll soon have to travel to Kansas City where they'll face Sporting Kansas City in the Eastern Conference Final on Sunday November 6, 2011. The match starts at 4:30 p.m. central time and will be broadcast on Fox Soccer Channel.